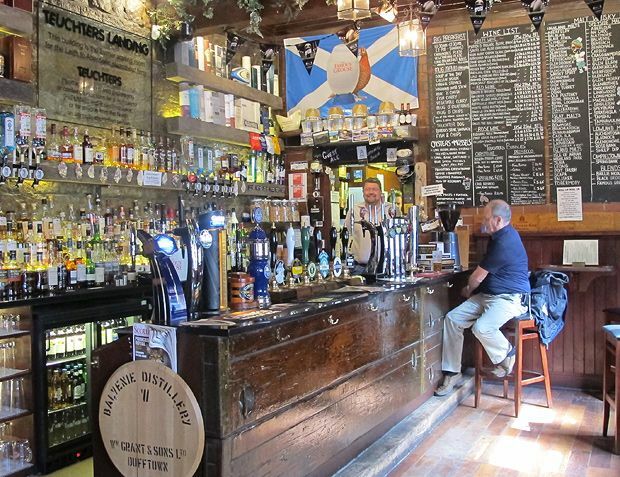 Relaxed waterfront pub with almost 100% Scottish-sourced food and drink, with an excellent whisky selection. Teuchters is something of a favourite on The Shore, thanks to its simple yet well-executed food menu and a superb range of Scottish cask beer and single malt whisky. Its traditional freehouse-style set up makes for a relaxed feel, while the waterfront location means it's a summer go-to for locals (there's free suntan lotion at the bar for those rare sunny days, so tan responsibly, folks). For a bit to eat there’s the 'mug menu', which sounds strange but works just fine: mug-sized portions of homely food, such as curry, chicken wings and risotto go down a treat. Non-mug options include a hearty (and hot) beef chilli and a solid burger range, with everything from venison to buffalo available (plus good ol' beef too).